Pharmaceutical Industry EXPOSED | Hupy and Abraham, S.C.
Can the Pharmaceutical Industry Be Trusted? In the 21st century, there seems to be a medication for every physical ailment. As patients, we expect that our doctors can find a prescription drug or medical device to make us better. Despite this hope of relief, many people end up with prescription drug and medical device side effects that are even worse than the original ailment. That’s because the pharmaceutical industry has corrupted our health care system and put profits before people. In his book Side Effects: Death, whistleblower Dr. John Virapen reveals that pharmaceutical companies “invest” more than $50,000 per physician each year to get them to prescribe their drugs. He goes on to say that more than 75 percent of medical scientists are funded by the pharmaceutical industry. In 2009, pharmaceutical titan Pfizer paid $2.3 billion after being accused of illegally marketing a painkiller called Bextra, among other drugs. The large settlement might make it seem like the justice system won the day, but the punishment hardly fit the crime. An Anderson Cooper 360 segment on CNN detailed how Pfizer’s sales representatives, with the approval of senior management, marketed Bextra for doses and uses that were explicitly rejected by the Federal Drug Administration. Naturally, Pfizer wanted to sell Bextra, which costs nearly $3 per pill, as opposed to ibuprofen, which costs pennies per pill. Former U.S. Attorney Michael Loucks explained how this took place while Pfizer’s lawyers negotiated a $430 million settlement in criminal fines for promoting the epilepsy drug Neurontin for unauthorized uses, just like they did Bextra. They didn’t even wait for the ink to dry on the settlement papers before breaking the law again! Between all the drugs in question, Pfizer made billions of dollars in profits. They also dodged a different, far more threatening bullet. Pfizer’s fraudulent tactics could have warranted an exclusion from Medicare and Medicaid, meaning people would have to pay out-of-pocket for the drugs. Such a punishment, though hardly inappropriate, would have been a death penalty. But Pfizer is considered too big to fail because that could leave thousands without jobs and millions without medication. So instead of holding them accountable, the feds cut them a deal. Pfizer owns a company that owns a company that owns a company called Pharmacia & Upjohn Company, Inc. What do they do? Absolutely nothing. But when the time came to punish Pfizer for its crimes against humanity, Pharmacia & Upjohn Company, Inc., pled guilty to the charges. And sure enough, Pharmacia & Upjohn Company, Inc. is now excluded from Medicare and Medicaid. Never mind that they’ve never sold a single pill! In the end, Pfizer simply set up a shell company to take the blame while they continue with business as usual. From 1999 to 2007, the FDA estimates the diabetes drug Avandia, made by GlaxoSmithKline, caused 83,000 heart attacks. GlaxoSmithKline’s own internal documents indicate they began studying the effects of the drug as early as 1999. Not only did they find that the drug was no better than Actos (the drug it was meant to replace), they found out it posed greater risk of heart attacks. But instead of publishing the study, as they’re required to do by law, they spent the next 11 years trying to cover it up. Predictably, they were afraid of what would happen to Avandia sales if the public knew the truth. By 2006, the drug’s annual revenue was $3.2 billion. That figure fell to $1.2 billion in 2009 after a New England Journal of Medicine study linked Avandia to a 43 percent increased risk of heart attacks. It’s hard to imagine how the drug was approved in the first place. However, it is important to note that a British Medical Journal study found that almost 90 percent of the scientists who wrote favorably of Avandia had financial ties to GlaxoSmithKline. This scandal resulted in a record $3 billion fine for GlaxoSmithKline, but their revenue exceeded that figure in just one year! Granted, $3 billion is a lot of overhead, but selling Avandia still turned out to be good business for GlaxoSmithKline. After all this, you would expect the FDA to ban the drug entirely. But Avandia is still available in the United States even though it’s banned in Europe. Instead of protecting the public, the FDA lets pharmaceutical giants continue to profit from potentially unsafe medications. Can Drug Companies Be Trusted? The unfortunate reality is that pharmaceutical companies sell harmful drugs and the FDA does not always stop them. 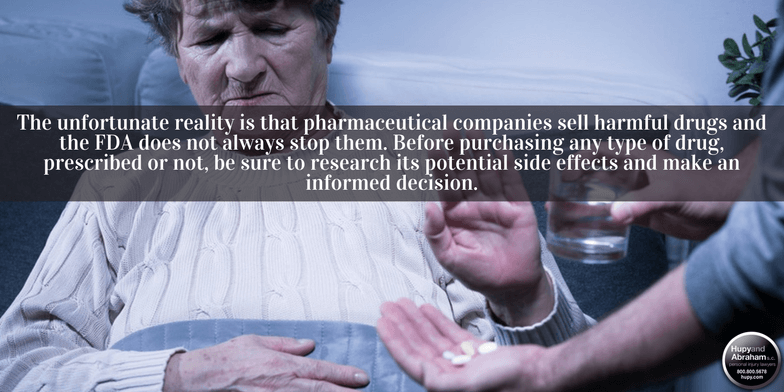 Before purchasing any type of drug, prescribed or not, be sure to research its potential side effects and make an informed decision. Remember, just because a doctor advises you to take a drug, doesn’t mean it’s safe or effective. But when pharmaceutical companies are caught hurting people, no one goes to jail and they don’t lose any operational privileges. They simply pay out a fraction of their revenue in settlements and fines. If you or a loved one has suffered unpleasant side effects from prescription drugs, browse our website for more tips about pharmaceutical class action cases and call the experienced lawyers of Hupy and Abraham. Our dedicated attorneys will fight for the financial compensation you deserve.